Hamilton Island of the Whitsunday archipelago is right off the Great Barrier Reef – one of the world’s greatest natural wonder. It’s not unusual to find entire seaside towns or destinations with natural beauty that have either evolved into or have been created to be adult playgrounds. Hamilton Island is one of 74 Whitsunday Islands whose evolution into an inhabited island started some 8,000 years when the Ngaro Aborginal tribe called it home. Captain Cook then discovered it in 1770 while he was charting Australia’s coastline. The island was bought in 2003 by world-renowned winemaker Robert Oatley, who developed one third of it with hotels, restaurants and bars, leaving the rest of the landscape in its pristine natural state. Hamilton Island is the only island in the Great Barrier Reef with its own commercial jet airport. You can get there with a commercial jet, private jet or a helicopter. Buggies are the mode of transportation around the island. The most luxurious accommodation is qualia – a Latin word meaning “a collection of deeper sensory experiences” – located on a peninsula on the island’s northern tip. The complex has 60 architect-designed pavilions within a forest of gum and palm trees. 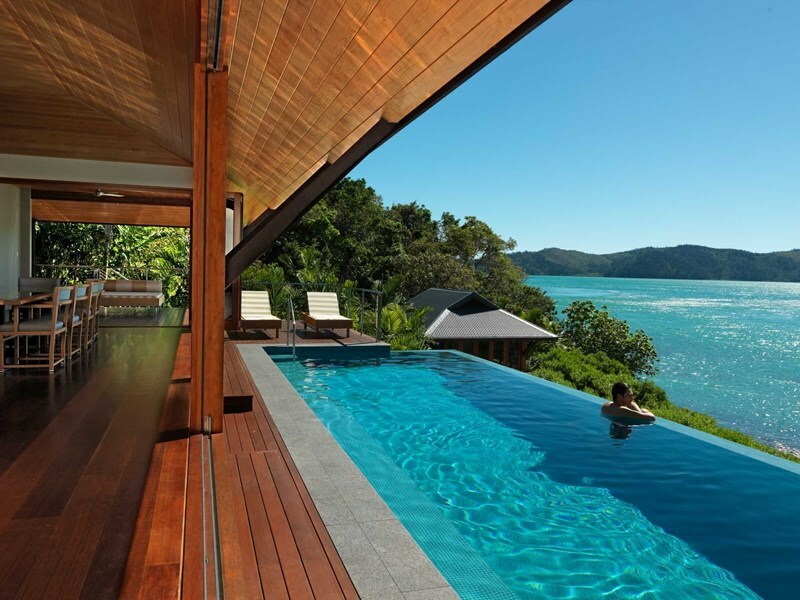 Many of them have infinity pools with stunning views spanning over the Whitsunday Islands. There are less expensive accommodation options such as Palm Bungalows, Reef View Hotel or Private Holiday Homes.